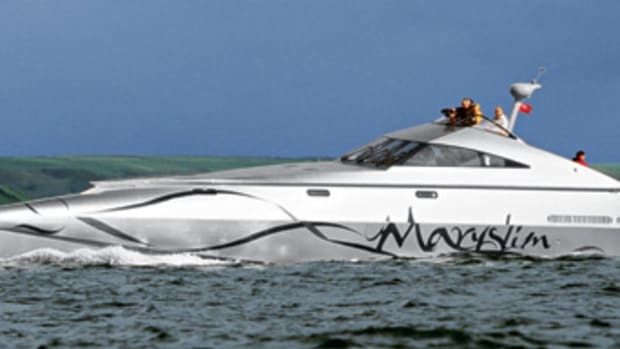 Known on the south coast of England as the owners of a small, successful chain of marinas, the Reddyhoffs commissioned small, successful, high-tech boatbuilder Multimarine to take on the project. Nic Bailey, designer of numerous intriguing machines from racing trimarans to the pods on the London Eye ferris wheel, was brought in for the layouts and exterior styling while High Modulus engineered the structure. As you can tell, there was no shortage of friends and admirers on hand for last March&apos;s launch celebrations in Plymouth, United Kingdom. It was an all-star cast, and the result is an Oscar-winning production. "She has fulfilled all our wildest expectations," says Mary. "It&apos;s amazing—I&apos;m overwhelmed with the quality of the build. She looks so pretty." With such a long, thin shape to work with, Bailey&apos;s interior has an inevitable tube-like quality, but with white moldings, pale Polystone worktops, a restrained use of dark-stained ash trim, and the big windshield overhead, it feels neither dark nor particularly cramped down below. 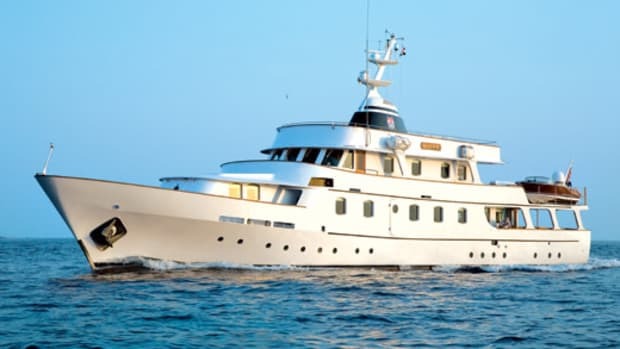 The Reddyhoffs&apos; en suite cabin is in the long, thin bow, and the guest cabin and second head are on the starboard side, with a couple of additional guest berths—which owners of more conventional craft might mistake for bookshelves—built into the bulkhead to port. 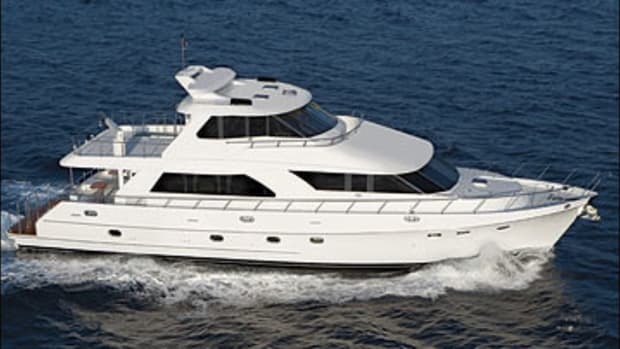 The galley and six-seat dinette sit just aft of midships, under the windshield, with the commanding, three-seat inside helm looking over the top. 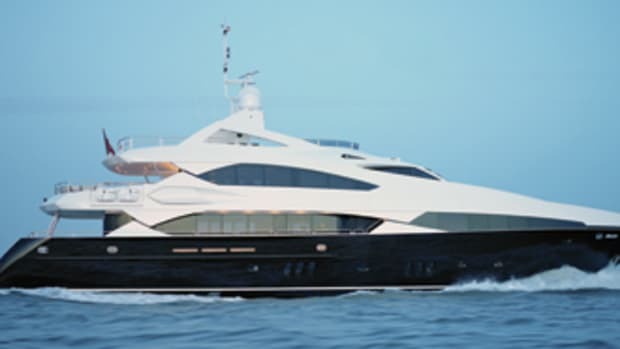 The interior works well, and it&apos;s some step up from a RIB, but it&apos;s far from palatial compared to the average 74-footer. 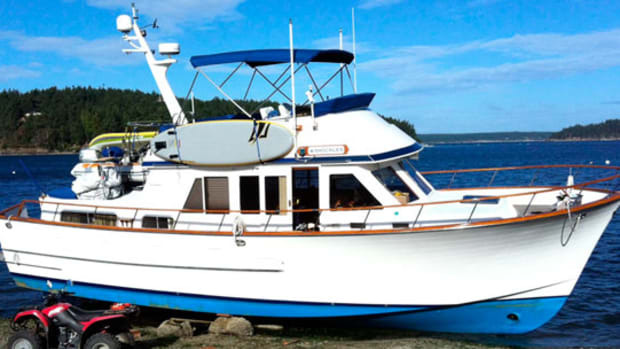 This is a boat designed quite uncompromisingly for speed, range, and seakeeping. 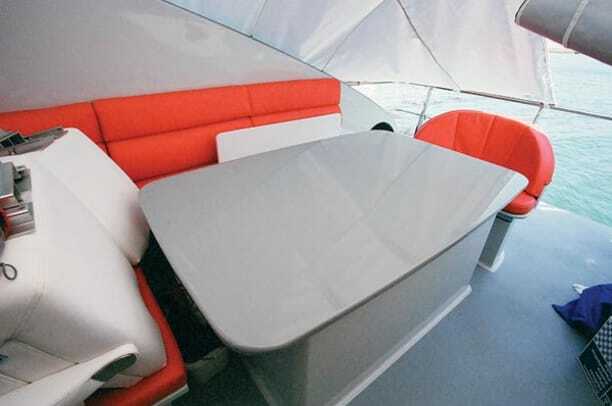 Beneath the dinette lies the main fuel tank, with a capacity of just over 3,500 gallons. Forward of that is another 240-gallon tank, which can be used to trim the boat, with another 300-gallon seawater ballast tank in the bow. Immediately aft, the solitary 1,650-hp Caterpillar C32 drives a big KaMeWa waterjet, its fuel supply protected by outsized filtration and water separators and a 950-gallon-per-hour Algae-X fuel-polishing system. 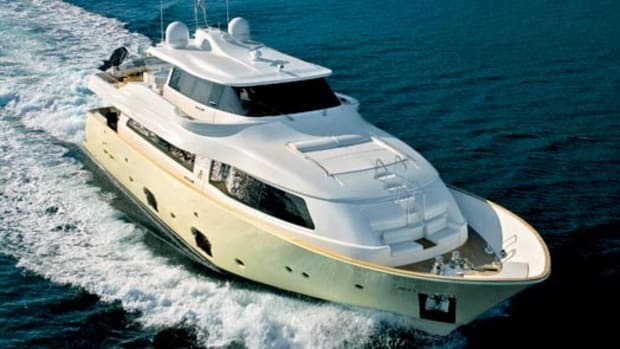 A genset and fire-extinguishing system are to port and a watermaker and water heater to starboard. Engine-space access is via the world&apos;s tallest hatch coaming: the base of the cockpit table. From the upper helm station, a two-seat affair perched high up over the cockpit, the view forward is of an ever-diminishing bow. When I first took the helm as we left the shelter of Plymouth harbour, towards the end of the yard&apos;s scheduled sea trials, I really had no idea what to expect. On the brief cruise between the marina and the sea, I could tell that her narrow beam made her quite tender, as she rocked gently on the wake of our photographer&apos;s RIB—which Mary looked down upon without a hint of nostalgia. But then I pointed the bow towards France and opened her up, and all doubt evaporated. 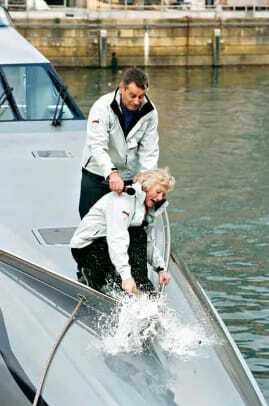 In my experience, jet-drive motoryachts and acceleration just don&apos;t mix. 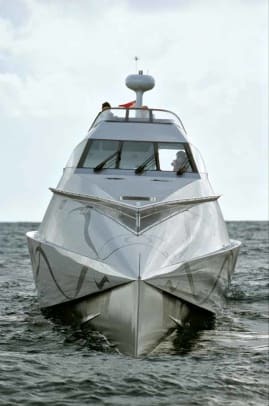 But even with a single engine, the lightweight VSV combines excellent power-to-weight characteristics with a slippery hull shape, and she just gets up and goes like a muscle boat. 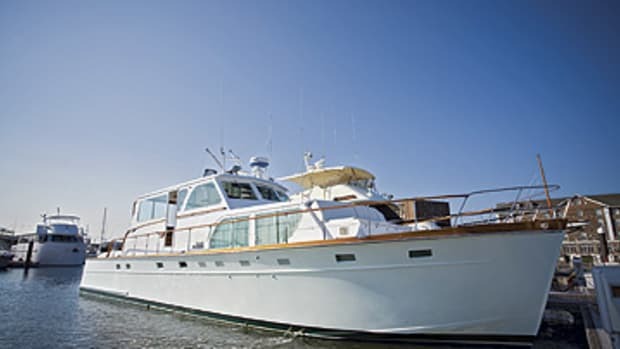 At 30-plus knots I swung the helm over, half expecting her to lean outwards, destroyer style. She heeled into it. The speed bled away, I eased off a little, and round she went—again, just like a muscle boat. It did not feel just familiar, it felt right—which for such a revolutionary concept is some achievement. But this is a VSV—a wave-piercer. We had to find some waves to pierce, so we headed offshore again in search of swells. 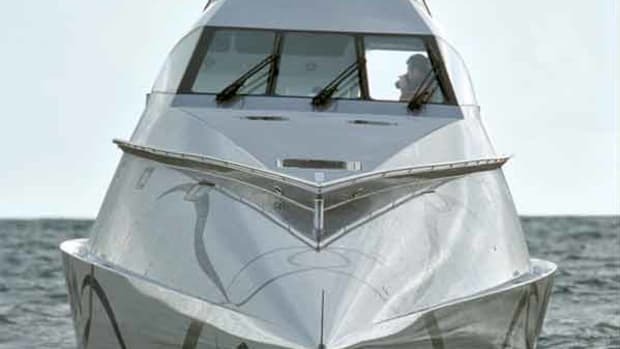 There was nothing too taxing out there, unfortunately, but in a boat some 65 feet on the waterline charging along at better than 30 knots, there was enough of a sea for me to get an idea—or there would have been in any ordinary boat. Watching the seas coming, my hand hovered instinctively over the throttle, ready to ease back, while my knees flexed, waiting for the impacts. But they never came. With no ballast forward, she loped over the swells with an easy gait, acknowledging the sea without picking a fight, like a black belt nodding to a bouncer. Downwind she exhibited the same calm confidence, tracking like a pro. Her owners were also disappointed not to encounter more serious weather on their delivery trip from the shipyard to their home port of Gosport, about 120 miles along the coast. "There were no waves!" lamented Richard. "But she went very nicely. We&apos;ve seen 33 to 34 knots so far," he added, "but she&apos;s got quite a lot of fuel onboard. 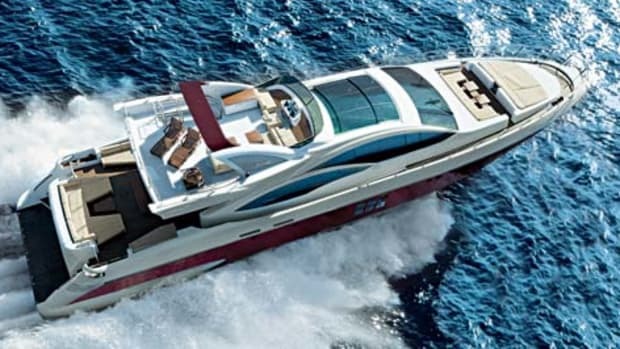 The yard has predicted 37 knots with [little] fuel, but the point with this boat is cruising speed, and she seems very happy at 28 to 30 knots. Mary and Richard collected their new boat in April, with plans already in hand for a busy summer focusing on a cruise into the Baltic, to Poland, in July. "It will be just a gentle break-in," concedes Richard. "We&apos;ve got a lot to learn about the boat. We&apos;ll see what our general confidence levels are like after the North Sea." Their real plans, formulated during those seemingly endless battles with the elements in their open RIB, are much wider ranging. The summer of 2008 will see the Reddyhoffs, with a fortunate friend or two along for the ride, taking on the North Atlantic with a trip north to the Faeroes, and from there up to Iceland and the Arctic. Ambitious? Maybe, in any ordinary boat. But there&apos;s something about this one that says she&apos;ll just take it in her stride.